This topic is an endless source of fascination to a modern audience. Children are aghast at the thought of world without crisps, chips, chocolate, fizzy drinks and the like. Adults, accustomed to the prepacked ready meal and the microwave oven, are astonished at the open fire and the time required to prepare fresh ingredients. All ages find the concept of plucking a real dead chicken a novelty. 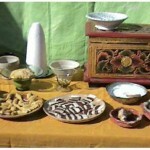 Food forms an integral part of our presentations for all time periods. 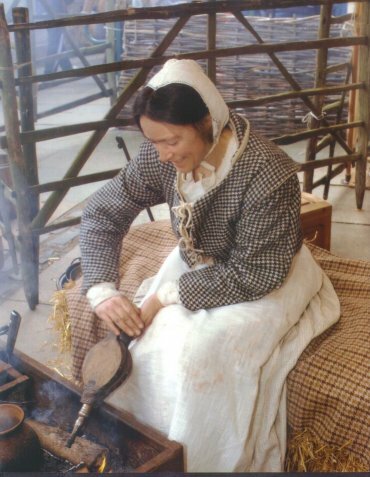 Food and cooking can be either a major demonstration in its own right or part of our general Living History display. The iron firebox was made to the English Heritage specification at the time and can be used on any surface without causing damage. It is not a replica of an authentic hearth but a modern compromise for use on historic monuments, tarmac surfaces and the like. The firebox and attendant cookery paraphernalia can travel with Frances the mule and a selection from the Toys & Games option. Transporting the oven precludes taking any large animals too but it can travel with poultry. 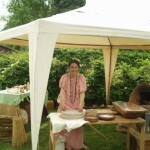 Breadmaking, from grinding wheat into flour on the quern to taking the baked loaf from the oven, is a major theme of our cookery demonstrations. 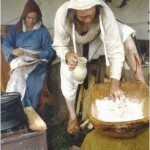 Breadmaking: grinding flour on the quern. Binchester Roman Fort 2004. 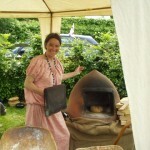 Breadmaking: the loaf in the oven. Binchester Roman Fort 2004. For our displays of Roman Cookery, most of the dishes we prepare are based on the surviving text attributed to Apicius, a wealthy aristocrat. Lower class fare is based on other texts, such as Cato, and archaeological evidence. 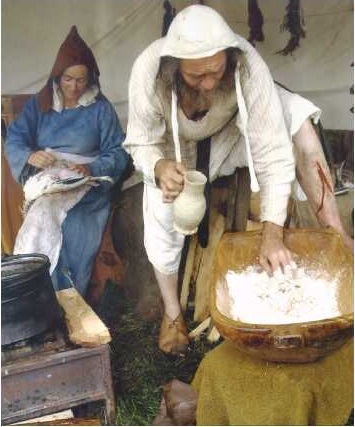 We also explore the food of the wealthy in Medieval times, from the surviving texts (see reading list at the end of Recipes page), and of the lower classes, using the ingredients that would have been available to them. 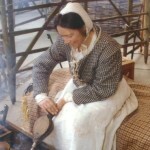 The introduction of new foods, discovered by the Tudor explorers, is the province of Bessie Tusser, who specialises in preparing “Banquetting Stuffe”. These luxury sweetmeats formed the final course of a formal meal. 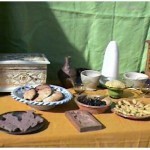 In 2008, research post-graduates at the Dept, of Archaeology, Durham University were encouraged to form a research group Durham Medieval Archaeologists (DMA) to plan a series of academic workshops on the five classical senses. As a forerunner to the session on Taste, a monthly lunch club was formed at my suggestion, with members creating and tasting a variety of medieval dishes. I provided a brief talk to put the food into its social context. The club ran from January to May and culminated in a selection of popular dishes being prepared for a medieval buffet lunch on the day of the Taste and Scent session.